Since the dawn of the rocknroll era, beer has been by its side. It’s stood by through the highs of highs, through those face-melting, whaling guitar solos, and it’s been there for lows of lows, with that bloke who thought he was onto something 6 days into a festival hauled up in his tent with a one string guitar. Either way you look at it, it’s been there, and we wanted to keep that tradition alive with our latest creation “Goes to ELEVEN”. Named after the saying coined by a member of the greatest band to ever grace the stage. Goes to Eleven pays tribute to Nigel Tufnel and the band Spinal Tap, and their deep level of respect for taking rocknroll to not just 10, but 11. In honor of the great Tufnel and the band who took music to places many questioned could ever be reached, we knew we had to go big, and we feel like we’ve done just that. An 11% ABV imperial stout made with 11 different malts, 11 kilograms of Galaxy hops and aged in Starward barrels for 11 months. 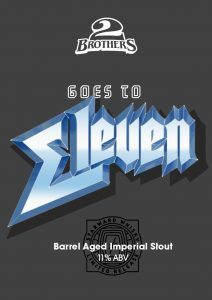 Goes to ELEVEN is big, bold and complex, and with a little back blending from our Guvnor Starward edition for some added complexity, this beer has become dangerously drinkable for its size. The beer will be released for GABS as well as hand bottled into 111 waxed dipped champagne bottles available for purchase after GABS from our Moorabbin BeerHall. Just like a Tufnel guitar solo at a live show, you’ll quickly realise an experience like this only comes around once in a lifetime. So get your hands on a glass or a bottle and enjoy the ride all the way up to 11.